Hush is a British artist who trained as a graphic designer at The Newcastle school of art and design. His work took him to Asia where he has emerged himself in a diverse range of cultures and traditions which has shaped the body of his work. 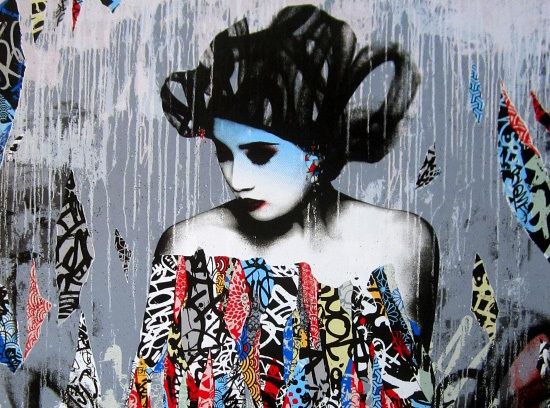 Hush uses a combination of painting, collage, graffiti, screen-printing and spray paint to create stunning imagery. He focuses on the female form, creating intriguing mystical, figures set against layered, tribal backgrounds. He was listed in the ‘top 20 artists to watch’ from The Independent and shows (in New York City, Miami, London, Basel, San Francisco and Berlin) and street pieces under his belt, the British native is also quietly achieving a mastery of his technique.